FINAL DECISION: I love, love, love Tiger. I would read a story about him going to the grocery store to buy stuff for dinner, but this story resolves some things from his novel so it is a wonderful companion. So glad to get another glimpse of my favorite Shifter couple. THE STORY: In the middle of the night, Tiger gets the feeling that someone needs him and takes off. But his mate is not allowing him to endanger himself alone again and insists on going along. Tiger knows that someone, somewhere needs him and he has to go. OPINION: I love when novellas in a series have a purpose. This one definitely is a must read in the series as it has some big secrets that are revealed. But what I love most is the characters of Tiger and Carly who already make such a loving unit. I love Tiger because he is so honest and centered. He doesn’t have the instincts or interest in deception so we always know exactly what he thinks and feels based upon his viewpoint. This story turns that on its head for a while when we don’t understand his actions, but (of course) everything is neatly explained in the year. The story is centered around the big reveal so I won’t go into that because it would be a spoiler, but I did love seeing how Tiger and Carly relate to one another as a settled couple and Conner is a cutie. The story has some action and drama and I loved seeing all the Austen Shifters again. The nice thing about this story is that it has consequence for the series and the characters. And what is truly to love about this story are the characters. Ashley has created a whole society filled with multi-dimensional characters so their cameos here all have consequence and a nice homecoming feel. I recommend this novella for everyone who is a fan of the series. WORTH MENTIONING: We get to spend some time with Conner Morrissey as well. I hope we get to see him more in the series. 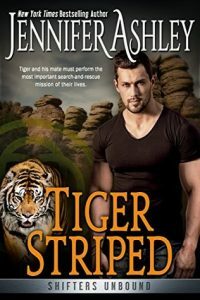 CONNECTED BOOKS: TIGER STRIPED is book 11.5 in the Shifters Unbound series. This novella is an update on the characters of Tiger and Carly from TIGER MAGIC. I recommend reading that book first to get to know the characters. STAR RATING: I give this novella 5 stars. NOTE: I received an ARC of this novella from the author in order to prepare this review. I was not required to write a review or to write a positive review. All opinions contained herein are my own. This entry was posted in Reviews and tagged Jennifer Ashley, Paranormal, Shifters Unbound by Sheila. Bookmark the permalink.